Every soccer player has those teams in their career that come together in just the right ways to create special memories and propel them forward as a player. For a group of college players and recent college graduates, that team came in the summer of 2015 when the Washington Spirit Reserves overcame a few years of just missing the big prize to win the W-League Championship. Over the years, the Spirit Reserves consistently produce an extremely impressive roster, producing talent that go on to make a lasting impression in professional women’s soccer. Many players in the NWSL spent summers training with the reserves team associated with the Washington Spirit organization, many of whom continue to play with the Spirit even after their time with the Reserves is complete. The 2015 Reserves squad, in particular, best exemplified the power and potential of a talented roster with palpable chemistry. Twelve of the players from the Reserves 2015 league winning roster currently play or played professionally in the years since winning the title, four of whom are currently playing for or training with the Washington Spirit’s professional team. In 2013, the Washington Spirit Reserves played its first W-League season under the Washington Spirit club structure after previously playing as the D.C. United Women. The team, based in Bethesda, Md. saw success early on, earning the title of W-League Eastern Conference Champions in 2012 and coming in third place overall in 2012 and 2013 respectively. In 2014, the team made it to the championship, losing to the Pali Blues after a hard fought match. Finally, in 2015, the last season that the W-League remained active, the Reserves proved its talent and anticipated success by securing the championship win under coaches Kati Jo “KJ” Spisak and JP Sousa. Five players from 2015 Reserves team are associated with the Spirit currently, including the 2018 No. 1 overall NWSL draft pick and U.S. Women’s National Team midfielder Andi Sullivan, as well as Maddie Huster, Yanara Aedo, Schuyler DeBree, and Meggie Dougherty Howard. Five 2015 Washington Spirit Reserves alumni participated in 2018 preseason camp with other NWSL teams including Imani Dorsey and Caroline Casey for Sky Blue FC, Ashley Herndon and Margaret “Midge”Purce for Portland, and Carson Pickett for Orlando. In addition Sarah Zadrazil plays for the Austrian National Team, as well as a club in Germany, Amber Stobbs plays for West Ham United in the FA Women’s Premier League in the UK, and Jennifer Skogerboe, who played in Portland for a brief time before relocating to South Korea, now plays for Suwan FMC of the WK League. While talent on the field is crucial, it is just as vital to create chemistry off the field as well, a point emphasized by Maddie Huster, sister of the longest tenured Spirit player, Tori Huster. 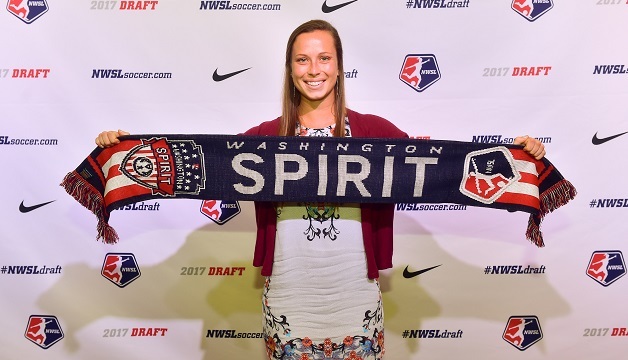 Dougherty Howard, who signed with the Spirit after the 2017 draft after two years playing with the Washington Spirit Reserves, gives credit to her time with Reserves in helping her get acclimated to the professional environment. When it came down to the wire, Spirit midfielder and Chilean National Team player Aedo made sure her time with the Washington Spirit Reserves counted, scoring the game-winning goal in the 89th minute of the 2015 W-League Championship. The Spirit Reserves went on to have strong and successful runs in 2016 and 2017 and will look to continue this upcoming season. Maybe this year’s team will go on to equal the success of the 2015 W-League Championship winning team.